Most of the people who live in the Middle East and North Africa are Arabs, but Arabs have only recently controlled the region. Ottoman Turks controlled most of the territory until World War I. The British and French replaced them in power. Many Arabs have dreamed of combining their individual countries into one pan-Arabic nation. Gamal Abdel Nasser was a leader in uniting Arab-speaking people. As a youth, he became a revolutionary opposed to British rule in Egypt. In 1952, Nasser led a military overthrow of King Farouk, and two years later assumed the title of president. For thousands of years Egyptians dreamed of building a dam to stop the annual flooding of the Nile River. Nasser first asked the Americans and the British to help build the dam. When both nations refused, Nasser seized the Suez Canal. Years earlier an Egyptian king sold the canal to the British. Nasser believed that it was the right of the Egyptian people to determine what happened on their land, so he nationalized or took control of the canal. Forces from Britain, France, and neighboring Israel attacked Egypt. Nasser turned to the Soviet Union (now known as Russia) for help when his Arab neighbors did not join the fight. With help from the Soviets, Egypt completed the Aswan High Dam in 1970. From 1945 to 1990, the United States and the Soviet Union were locked in a battle to influence the rest of the world. The two nations never fought one another, but the tensions on both sides were known as “the Cold War.” Both the Americans and the Soviets sought to influence the Arab world. The Soviets threatened to use nuclear weapons if the Suez crises did not end. The American government, fearing the fight could bring what might become a third and final world war, encouraged both sides to agree to a peace treaty that allowed Egypt to keep the Suez Canal. Nasser merged his nation with Syria in 1958 to form “the United Arab Republic.” Iraq also considered joining the union. The Syrians felt the Egyptians did not treat them as equals. After a 1961 drought in Syria, army officers seized control of the nation and declared independence from Egypt. Nassar kept the name United Arab Republic as a symbol for his hope of Arab unity. After Nasser’s death, the nation was renamed the Arab Republic of Egypt. Many Arab leaders continue to discuss forming a single nation. An Arab nation might stretch from Morocco to Iraq, but it is unlikely to happen in the foreseeable future. 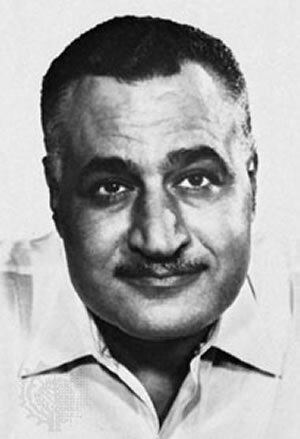 Gamal Abdel Nasser Hussein (1918 – 1970) was President of Egypt from 1956 until his death. He planned the 1952 overthrow of the monarchy, and was deputy prime minister in the new government. 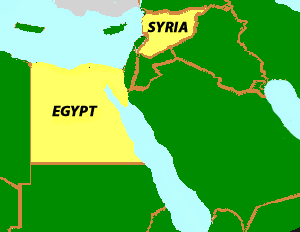 Egypt and Syria formed the United Arab Republic from 1958 to 1961. Nasser hoped other Arab speaking nations would join the union, but none did. When Syria seceded from the union, Egypt continued to be known officially as the “United Arab Republic" until 1971.